Hurrah, a new import story! 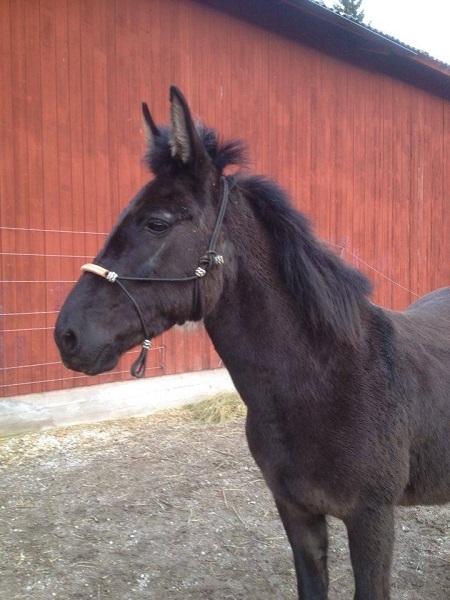 Alula is actually a double import: initially brought over from the US to Europe, she then travelled from Germany to Sweden where she resides with her current owner, Tina. 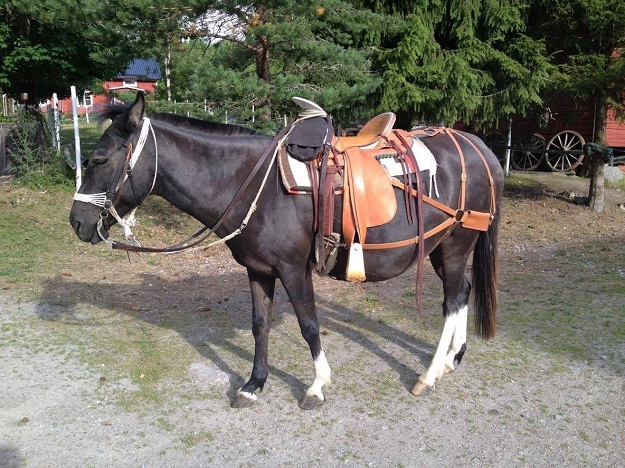 Thera are very few big mules in Sweden and I wanted one that I could ride on. 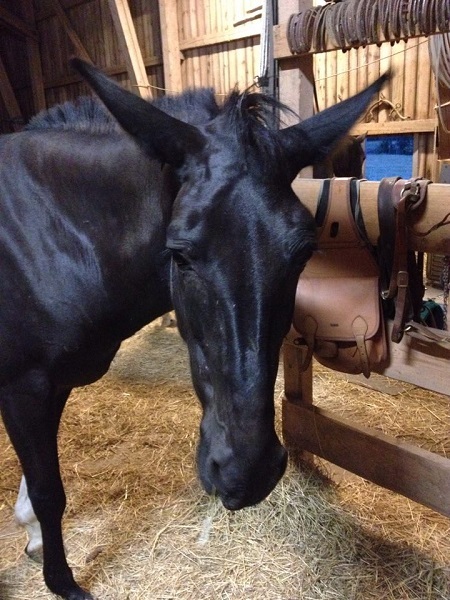 I had a smaller mule for 18 years (12hh) that I used for packing on trail rides. 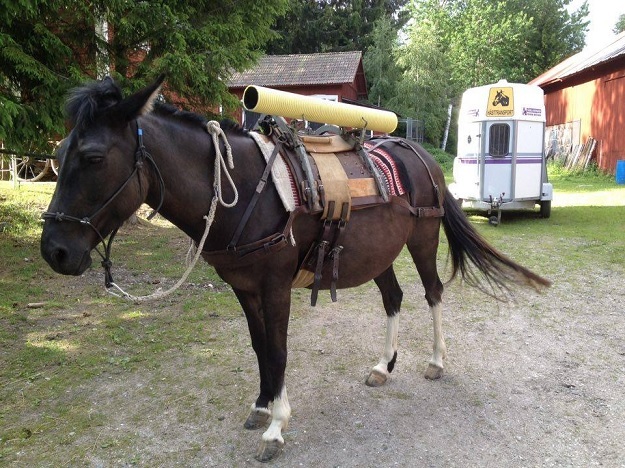 I came into contact with Alula’s seller through the Swedish Donkey Society. During the process, my small mule became sick and I had to put him down. It nearly broke my heart! So, when he was gone, I decided I needed to buy a new mule. I had always wanted a gaited mule, but buying one from the USA would be too expensive – so finding Alula in Germany was just sheer luck! The seller had imported her from the USA in 2014, along with her big donkey half-sister. The reason she put up Alula for sale was probably that a mule is a bit more than a horse, so the seller was not prepared for the effort of training a mule. First day at her new home in Sweden. The process took about 5 months. We had contact via Facebook and email and the seller sent a lot of pictures and videos. We arranged the transport so that we met in Denmark at a place owned by a friend of mine, who had worked with mules in the US. The papers we needed for export/import between Germany/Sweden was only the veterinary exam. There where no obstacles. To my surprise, when we drove back over the bridge between Denmark and Sweden, the border police did not even look inside the horse transport or ask for any papers. And the same thing happened for the seller when she passed the Germany/Denmark border!!! Practice before a filmshooti earlier this summer. She’s carrying an old Swedish army packsaddle. No surprises, but some memorable moments. She was bigger than I expected, but very easy-going. We had an overnight stay at some friends in the south of Sweden and there was no problem loading/unloading her, even though we were complete strangers! Alula’s parents: Red Rum and Busting Loose Sweetheart, a champion Tennessee Walking Horse mare. 5. What advice would you give to anyone looking to import a mule (or any equine) from another country? My advice is to be sure it is a serious seller. 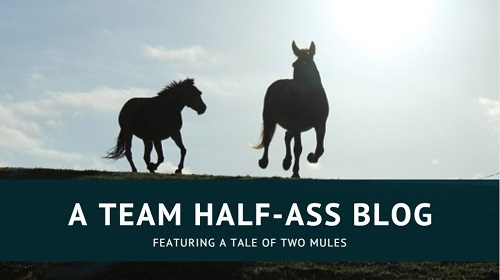 When it comes to mules, it’s better to transport them yourself – or at least have a transporter used to mules. They are special and cannot be treated like horses. And if you use a equine transporter, make sure it is a good one.